Variable rate in-season crop management is showing economic promise in Concord vineyards. Novel practices, such as mechanized shoot-thinning, are scalable and require less upfront capital than other methods of mechanized crop management. 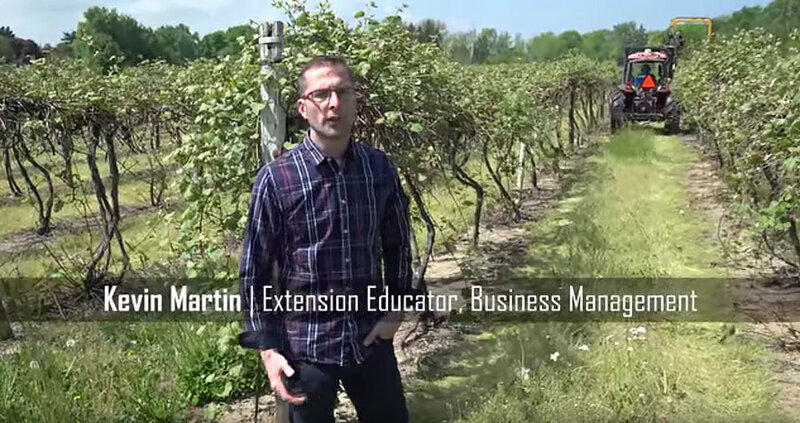 By minimizing upfront capital costs, variable rate shoot thinning technology can be practical for bulk juice and wine grape growers as small as 50 acres. Significant variation within blocks decreases potential yield and brix. Variation within a block also places stress on low-performing vines that may be managed based on the average potential of the entire block. The economic benefit of zonal management is highlighted by shoot thinning. By focusing only on areas that are out of balance we are maximizing production within each zone, rather than for the block as a whole. We have captured the costs of applying variable rate shoot thinning technology. We have also begun to observe the benefits, measuring variable crop levels within a block. Going forward, yield data and pruning weights will be used to measure the impact on potential future crop. Crop potential in future years drives the economic benefits of variable rate technology. Mechanized shoot thinning is not a common practice in eastern viticulture. For growers that already own mechanical harvesters, we will also investigate the economic benefits of mid-season crop adjustment. The risk management benefits of using a harvester to remove excess fruit have been established. We will be taking a look at the costs and benefits of modifying a harvester with variable rate technology as a supplemental option for variable rate crop load management.